The Tseung Kwan O – Lam Tin Tunnel is a dual-two lane highway of approximately 4.2 km long, connecting Tseung Kwan O and East Kowloon. The Tseung Kwan O – Lam Tin Tunnel, together with the Trunk Road T2 in Kai Tak Development and Central Kowloon Route, will form Route 6 in the strategic road network providing an express link between Kowloon West and Tseung Kwan O. The Route 6 will also mitigate the road traffic condition of central and eastern Kowloon. More information can be found on CEDD website. The proposed TKO-LT Tunnel runs beneath the Chiu Keng Wan Shan in a straight alignment with a branch tunnel for direct connection to the Eastern Harbour Crossing. At Kwun Tong side, the tunnel connects to the Lam Tin Interchange (next to the toll plaza of the Eastern Harbour Crossing), which links the TKO-LT Tunnel to the Trunk Road T2, Eastern Harbour Crossing and local road network of Kwun Tong. The main carriageway of the Interchange is around 20m below the existing ground level. To the west of the Lam Tin Interchange, the tunnel is embedded in bedrock running beneath the Cha Kwo Ling Village. This section of tunnel connects to the proposed Trunk Road T2 at the waterfront while maintaining a distance from the Cha Kwo Ling Tin Hau Temple. 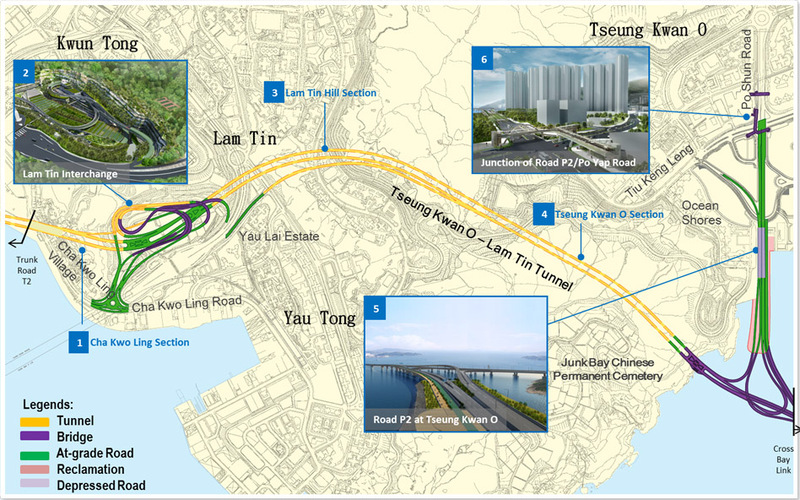 At Tseung Kwan O, the TKO-LT Tunnel links to the CBL and Po Yap Road via the Tseung Kwan O Interchange.